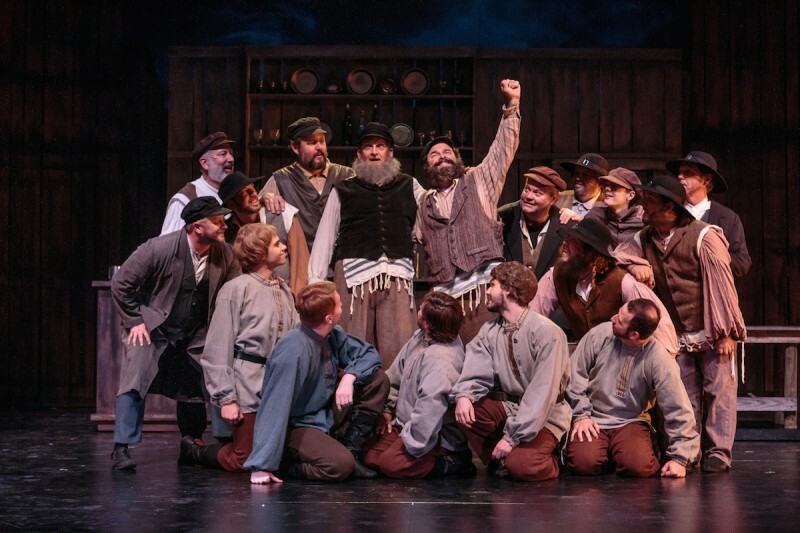 Jeffrey Hoy as Tevye in Cocoa Village Playhouse’s ‘Fiddler on the Roof.’ Photo by Goforth Photography. …then…let it be known that this show has book by Joseph Stein, music by Jerry Bock and lyrics by Sheldon Harnick and was based on stories by Sholem Aleichem. 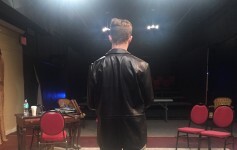 The musical’s story is set in the village of Anatevka in 1905, a period of frequent antisemitic pogroms and political upheaval in czarist Russia. 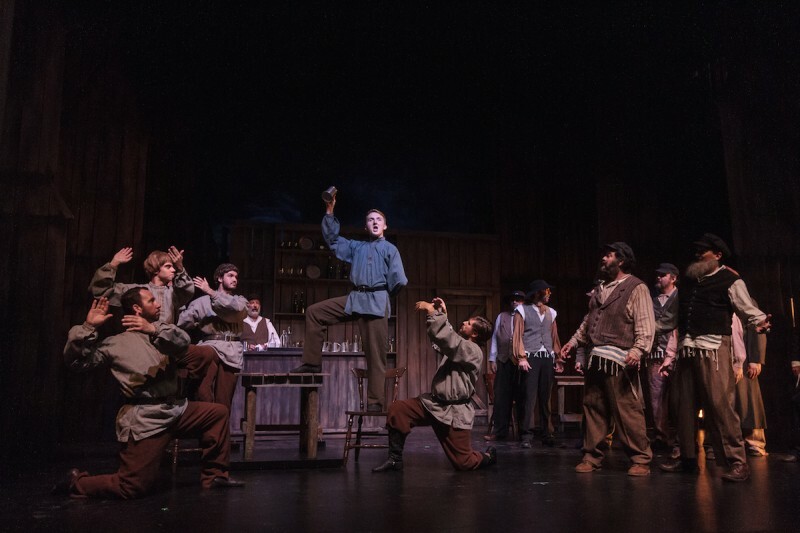 It revolves around a father named Tevye, a man who believes in tradition but faces the constancy of social change. 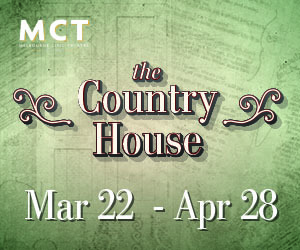 It begins when Tzeitel, the oldest of his five daughters rejects Tevye’s arranging for her a marriage to a rich man. Instead, she chooses a poor man. Then, Hodel, the second daughter falls in love with a poor activist student and moves away. Then, Chava, the third, falls in love with a non-Jewish man from the czarist guard. Jeffrey Hoy brings such tenderness to Tevye and makes him the loving father everyone deserves. His easy stage presence delights, especially in scenes when Tevye looks to the heavens and chides God for an ironic sense of humor. Rather than recreate what others have done with this role, most notably Zero Mostel and Topel, Dr. Hoy makes this role his own. 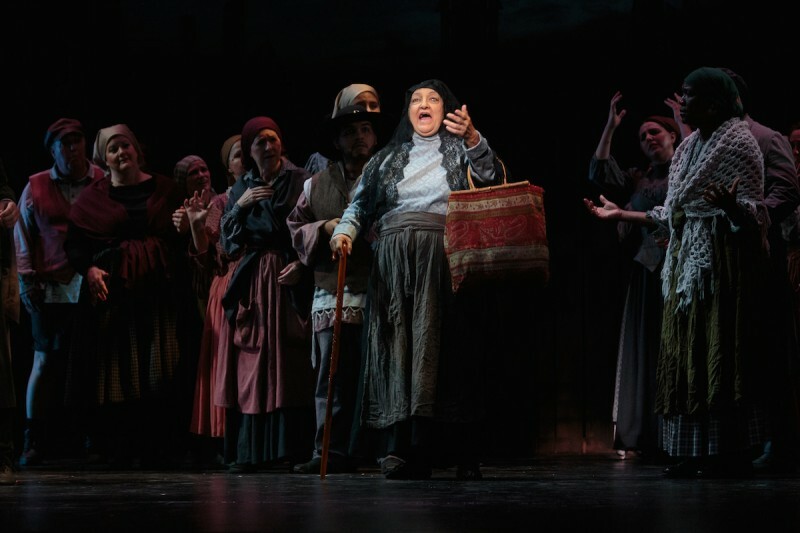 Gaye Solano makes a fine Golde, Tevye’s wife, who runs a tight domestic ship but has the depth of heart to match her husband. Jessica Garrett and Chad Carff sweeten the stage as Tzeitel and Motel, the poor tailor. Eliana Berrean and Dillon Giles are fiery as Hodel and Perchik, the student who has the audacity to believe that “women are people, too.” And Katie Flinn and Mitchel Burns are wonderfully appealing as Chava and Fyedka, the czarist guard. A word here about Mr. Burns…is there anything this young talent can’t do? Everytime he appears on stage he shows more dimensions to his stage talent. His Jack in “Into the Woods” last season in Titusville’s Enchanted Forest was pure musical delight; then, his Freddy in CVP’s “My Fair Lady” was filled with such earnest romance; now, he wins the audience with his lively Fyedka, first holding an impossibly long note then performing challenging Russian leaps for choreographer Wendy Bernier. Rick Roach charms as crusty butcher Lazar Wolf and Sharon Metz squeezes out every drop of humor to Yente. Director Anastacia Hawkins-Smith brings out some very good moments here, especially the wild and wonderful dream sequence — April Norton is a hoot as ghostly Grandma Tzeitel and Jeanette Roach is boldly fantastic as the towering Fruma-Sarah. Ms. Hawkins-Smith makes spot-on use of lighting which at one point hides the chorus behind a scrim and then lights it to suggest the haunting background of a struggling people. However, this show runs more than 3 1/2 hours, with a first act of nearly two hours…oy, my tuchus. The pace borders on the sluggish and needs to be tightened, cues need to be picked up faster, and especially musical cues. 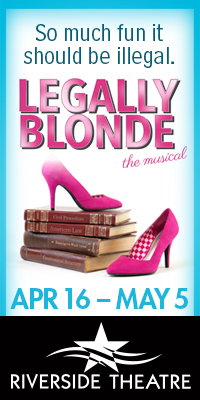 At the performance I attended, it felt as if every musical number left actors waiting for the music to begin. But oh, that music. 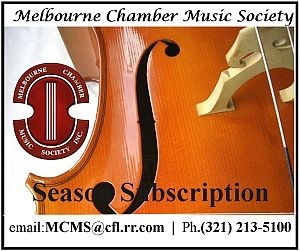 Led by music director and conductor William H. Yoh, Jr., the orchestra is so fine with exquisite violin work. 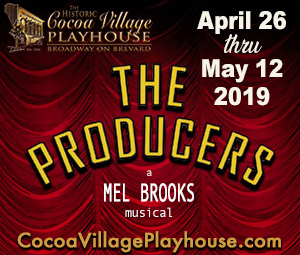 Add wonderful visuals by scenic/lighting designer Ian Cook, costume design by Daniel Hill and scenic painting by Sheryl Koby, you have the type of production values expected at Cocoa Village Playhouse. SIDE O’ GRITS: “Fiddler on the Roof” runs through May 24 at Cocoa Village Playhouse, 300 Brevard Ave., Cocoa. 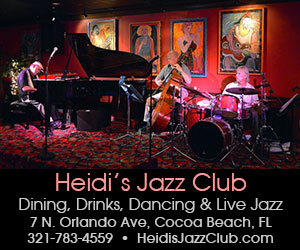 Tickets are $16 to $24. 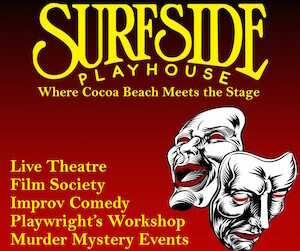 Call 321-636-5050 or visit www.CocoaVillagePlayhouse.com.